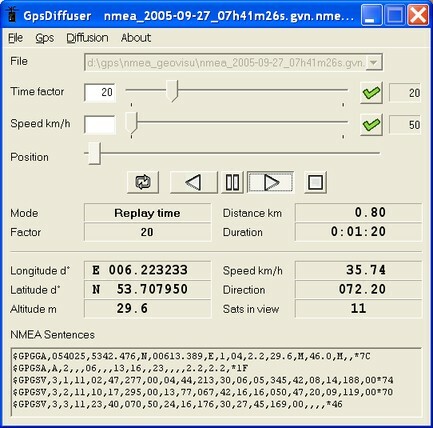 GpsDiffuser is a software that diffuses real-time GPS data and can play file containing GPS data. Diffusion is done by sending sentences at format NMEA 0183 using UDP protocol. Diffused data come either from a GPS receiver or source issuing on UDP in real time navigation mode, either from a replayed file. In case of replay, position and speed settings are modifiable. GpsDiffuser is at least compatible with itself, GeoVisu and GpsGate. This software is free of charge. It runs on Windows 2000 / XP / 2003 / Vista / 7 . GeoVisu can navigate using sentences sent by GpsDiffuser on UDP ports. Installation note : This version doesn't overwrite previous version but it does not take into account changes made in the configuration file. A new entry in the windows start menu will be created for this version. The installer install of programs of the GeoVisu Suite.